At Tweed Coast Coast Sales we have a frequently changing range of quality used caravans to suit every budget. Sell on consignment with us! At Tweed Coast Caravan Sales, we pride ourselves on providing the biggest range of caravans for sale that offer the best value for money while incorporating the latest innovative designs and concepts. Family owned, we are proud to be one of the most experienced caravan dealers both in Brisbane and on the Gold Coast. 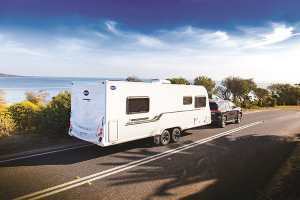 We stock both new and used caravans as well as quality Hans trailers and are a specialist stockist of the best Bailey Caravans for sale on the Gold Coast, looking after caravan enthusiasts from Brisbane, South East QLD, Northern New South Wales and all over the great Australian states. Our goal is to provide you with access to a range of styles, including Pop Tops and Slide Ons that offer the best in luxury and functionality so you can experience the great outdoors in comfort and style. Caravans are no longer the cramped holiday alternative; today’s designs are more like a 5 star hotel experience on wheels! There’s no limiting your adventures or the sights you wake up to in the morning, we have the best models for outback adventures, beach holidays, park hopping or a relaxed cruise to discover Australia’s hidden gems. Our team are experienced and knowledgeable in every aspect of the caravans we stock at our dealership. With years of experience in looking after the needs of the caravanning public, our family business treats you like a best friend. We will ensure you have everything you need to enjoy your holiday, whether it’s your first experience or your 300th day on the road. All new and used caravans for sale from Tweed Coast Caravans are fully serviced and workshop tested before delivery to ensure you are receiving a high quality vehicle. Their sturdy, high-quality design means they handle as well on a paved Brisbane road as they do in the Cape York wilderness. Let us answer all of your questions when you visit us. No matter your level of experience, our expertise and knowledge can prove invaluable and we will always work to supply you the best caravan to suit your needs rather than the one with the biggest price tag. We often work with clients who require a customisation or whose needs can be better met by a different model to the one they initially had in mind. If you would like a custom made van we are happy to sit down and design your layout, colours and features. Let us help create an experience that is full of excitement, memories and enjoyment. Leave the hard work to us and your next caravan will be exactly what you’ve been dreaming of. You will be able to start your caravanning adventure confident and worry free. Contact the premiere caravan dealers in Brisbane or on the Gold Coast today or view our new Bailey Caravans or used caravans for sale. Drop by our location at South Tweed, New South Wales, conveniently located right on the Coolangatta/Tweed border, close to the Gold Coast, Queensland. Or give us a call on 07 5524 3745. All sorts of Caravan parts & Accessories. Come & rummage through, you might find just what you’ve been looking for at a bargain price.